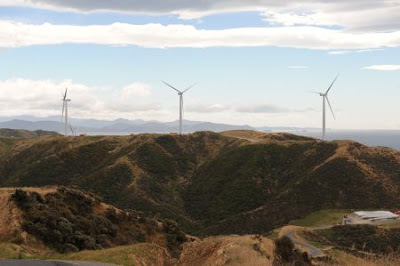 Project West Wind is Meridian Energy’s new wind farm at Makara, near Wellington, New Zealand. Last week I had the pleasure of taking a guided tour with the Institute of Professional Engineers of NZ. It was great to witness how a big project like that can all come together despite the many challenges faced. The biggest of these challenges was how to actually get the components to the site – if you are unfamiliar with the terrain it is incredible steep and rocky in places. This was done by barging the components across from Picton in the South Island, to a custom built wharf, moving them onto trucks, who transported them up 33 km of custom built roads to their respective sites. 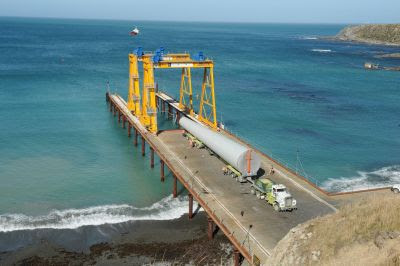 As the towers are 70 m tall, each blade 40 m long and each housing the size of a small truck, this was no mean feat, and the roads were carefully constructed for the correct gradients and turning arcs. The turbines were produced in Denmark by Siemens, who sent out 50 engineers to install them. Meridian has a number of other proposals in for more wind farms which will no doubt equate to incredibly large sums of money that will provide great opportunity for NZ’s leading engineering firms.